Posted on August 31, 2010 by Rohit..
D’décor, curtain maker and exporter, made an announcement regarding the re-launch of its brand. It has signed in Bollywood actor Shah Rukh Khan and his wife Gauri as its brand ambassadors. The brand intends to enter the homes of one million people in the nation after it re-launches its brand here. The designs that D’décor has created are from artworks, its creative source, Simone Arora from Europe, who has the best design houses, which craft beautiful fabric pieces . Sanjay Arora, Managing Director of D’décor, said that each home alters in the way it looks like, and a small makeover with curtains and upholstery would lend a huge perfection to the entire set up. Making each and every home in the nation, beautiful is the mission that the firm intends to achieve. Apart from the fashionable designs that D’décor has, it as well offers homemakers fire retardant and fabrics that have Teflon coatings on them. The furnishings are going to be available in the US, India and other European markets, with a price ranging between Rs. 250 and Rs. 1,500. The brand already exports goods to over 60 nations. The firm is optimistic about stepping into the Indian market after having made its mark internationally. Sony Ericsson today that it will leverage Sony Corporation’s existing partnership with UEFA to activate a global marketing programme around the UEFA Champions League until 2012. This will see Sony Ericsson become the official mobile handset of the UEFA Champions League, as part of Sony’s UEFA Champions League Partnership. 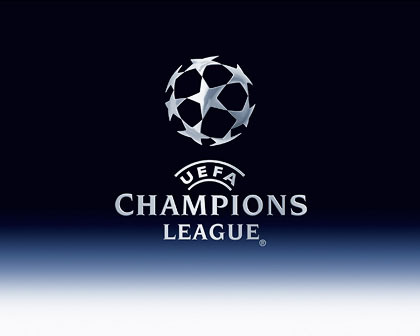 Sony Ericsson Xperia will be the Official Smartphone of the UEFA Champions League. The programme will have a fan-focused approach and will build on previous marketing programmes that saw Sony Ericsson grant football fans from around the globe greater access to the game they love. Offering the best possible ‘on-device’ experience will be at the heart of the new programme, which will utilise the GPS capabilities of Sony Ericsson Smartphones to enhance the fan experience, and will include a new mobile application developed in conjunction with UEFA.com. Sony Ericsson is uniquely placed to enhance the fan experience, as regardless of whether fans watch the game in a stadium or in a public place with friends, they will have their mobile handset with them. Hollywood stars Charlize Theron and Orlando Bloom have been named as the new faces of Japanese fashion brand Uniqlo. The Japanese fashion retailer has named the stars as its global brand ambassadors for its new Made For All collection, reportsFemalefirst.co.uk. As part of a year-long contract, the Monster actress and the Pirates of the Caribbean star will appear in Uniqlo’s worldwide advertising campaigns. The pair will promote the company’s new tagline, which focuses on its commitment to providing clothing for everyone, regardless of nationality, age, occupation or gender, with the new advertising campaign expected to be unveiled in the autumn. Posted on August 26, 2010 by Rohit.. 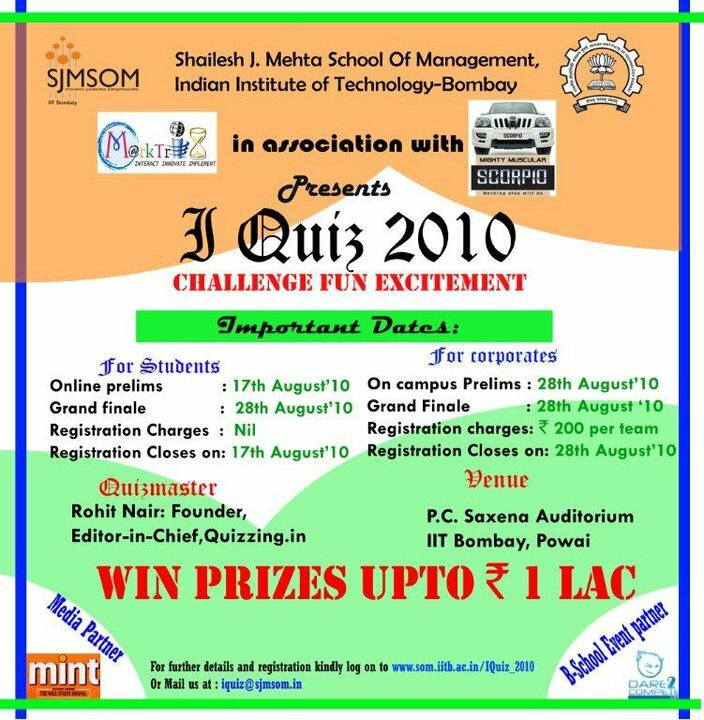 The Marketing Club of IIT-SJMSOM- Marktrix in association with Mahindra Scorpio presents I Quiz 2010– The Business Quiz. Hosted by Rohit Nair :Editor-in-Chief, Quizzing.in , 28th August promises to be an Advertising and Marketing Extravaganza with India’s best quizzers challenged in the Biggest B-School Business Quiz of the season yet. So don’t miss it! Prelims start at 10 am – P.C Sxena Auditorium, IIT-Bombay. Posted on August 25, 2010 by Rohit..
A clothing company has filed a lawsuit against Madonna that says the pop megastar’s fashion line for teens, Material Girl, is infringing on its brand. Reuters reports that L.A. Triumph says in court documents that it has been selling clothing under the same name since 1997, and that the singer — who, for the record, has been dubbed the Material Girl since 1985 — does not “have the right to trade in the same space under this brand.” The suit was filed Thursday in California District Court. Madonna has yet to comment on the matter, nor have reps for Macy’s, the department store where Material Girl apparel is sold. Madonna designed the ’80s-reminiscent line with her 13-year-old daughter Lourdes. Like.com, which began life as Riya.com, a visual search company has finally been acquired by Google. As Riya.com, the company focused on facial recognition, leverages computer vision and machine learning technology to allow users to search for goods by visual similarity. While Google’s primary interest in the company is likely to involve using its technology to add value to its core search products, Google also stands to gain through the enhancement of related image recognition services like Google Goggles. Like.com CEO Munjal Shah confirmed that his company has agreed to be acquired in a post on Like.com’s Web site . This acquisition is Google’s third in the recent past , after it acquired social currency site Jambool and social entertainment site Slide.com earlier in August. How many more to go, is the question most analysts are asking. To follow the news stay tuned! Bhilai Steel Plant destroyed all existing competition at Nagpur as they garnered the Top 3 positions at the Nagpur Edition of the Tata Crucible Corporate 2010. S. Ramani, the winner from Nagpur has been extremely kind to share with us the questions from the Nagpur prelims. Thanks a lot Ramani and wish you the very best for the National Finals! Hope you come home with the grand prize! “Thoda Simple Socho”. Its logo is a modified version of peacock. It’s a big financial service company ? Man’s shoe with closed front and back open, named after which university ? “Sphere of connectivity design” new logo. Only company that encourages copying ? Which company owns North star brand of shoes ? 1992 treaty Marakash gave rise to which currency ? ARAMCO is of which country ? ‘Software for the most advanced microprocessor. Which Indian newspaper ? Live every moment caller tune. Who is behind this ? Which Public sector was first to list in BSE ? How is Osetmivier better known as ? Which word has come from French word Little Bag ? To be all things to all people is the philosophy of which internet giant ? KV pendarkar in 1952 started which company in Nagpur ? HQ of which giant is known as STAR inMumbai ? It is known as Sure,Shield, Reward in UK, SA, and Nigeria. It is known as what (Soap) in India? Graphic groups, Lucas films 1975. Now it is with Walt Disney ? Three stars which korean company ?